The brightest ChromaCove™ LED lighting has a super wide-angle output with a high dynamic range driver. This makes it perfect for large dome installations. 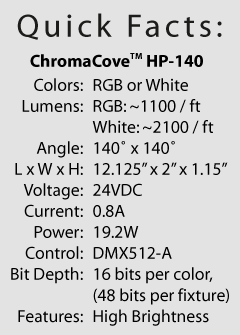 The ChromaCove Signature Series High-Power fixture is a very bright and colorful fixture. 15 CREE LEDs offer 10-20 times more power than the standard consumer RGB fixtures with only 50-100 lumens. At ~1100 lumens of the primary colors of light RGB or ~2100 lumens of white, these fixtures really are the brightest fixtures on the market. Excellent low-end dimming and brightness control is achieved with ChromaCove's unique driver designed specifically to meet the challenges of the planetarium and immersive theater market. Perfect for use in low-light conditions, ChromaCove LED lighting does not "pop" on, flicker or stutter as it fades. Additionally, PWM strobing is eliminated with our enhanced-spectrum modulation, providing a visually steady illumination. This is important for use in areas where viewers are visually following a moving point of interest, such as guiding visitors to an exit. Each fixture can be configured for a wide range of control scenarios by combining built-in features. With 36 unique profiles to choose from, features such as Low-End Curve Correction, ChromaBlend, Bit Depth and Internal Fade Slewing make the ChromaCove High Power fixtures a powerfully adaptable lighting device. With a wide variety of brackets specifically designed to mount each fixture for a multitude of various situations, while providing ease of angle adjustment. Licensing This fixture utilizes technology licensed from the Philips patent portfolio. 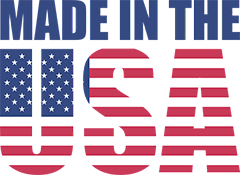 ​All ChromaCove™ LED fixtures are designed and manufactured in the USA using high-quality CREE leds, RoHS compliant components and a lead-free process.